Ancestry to Retire Family Tree Maker Software by Kendall Hulet at Ancestry.com Blog - Big news this week! MyHeritage Releases Over 150,000 Family History Books - FREE to Access by Randy Seaver at Genea-Musings - More big news this week! Five Reasons We Can't Find the Records We Want by Elizabeth Shown Mills at Evidence Explained Blog - Great food for thought, especially the last line of this post. 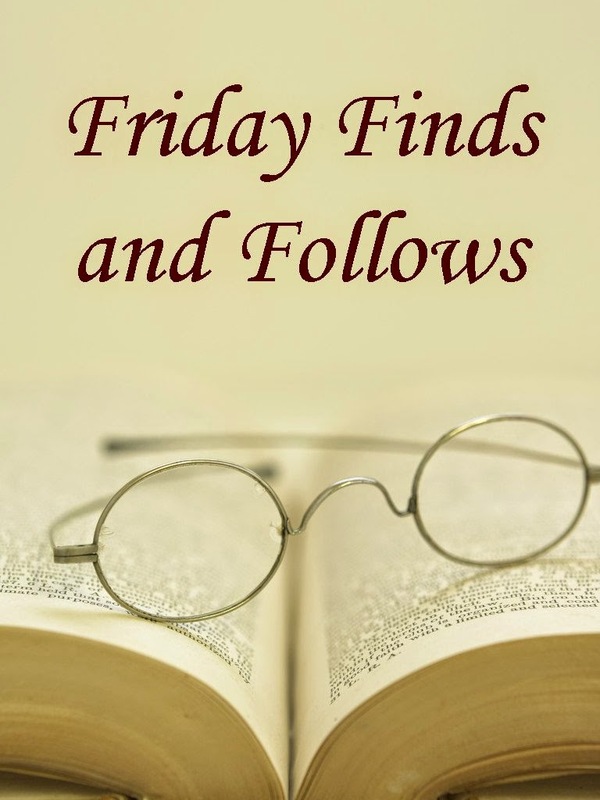 Finding Nellie Part 2: Married, with Mysteries by Elizabeth O'Neal at Little Bytes of Life - Of course, you'll also have to read Part 1. 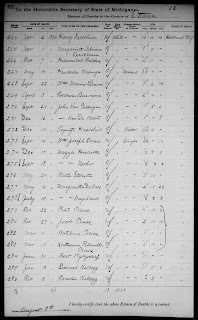 Prioritizing Genealogy Work by JLog at JLog Blog - "If your health were to fail tomorrow, or your life circumstances change dramatically in some other way, which of these [genealogy projects] would you wish you’d spent the most time on?" Some good thoughts to ponder. No new likes this week (I'm taking a hiatus from Facebook until after the New Year). 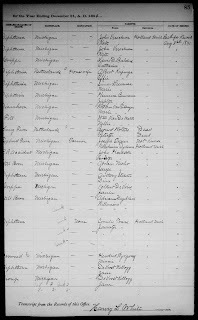 Be sure to check out Katherine R. Willson's incredible Genealogy on Facebook list for more genealogy pages and groups. Facebook: I'm taking a hiatus from Facebook until after the New Year. The Family of Isaac and Rebecca (Hewitt) Luke, c. 1888. Unknown location, possibly Avon, Bon Homme Co., South Dakota. Original photograph privately held by Dennis R. Luke, [ADDRESS FOR PRIVATE USE,] Oregon. This wonderful photograph I posted yesterday on Wordless Wednesday was sent to me via email by a distant cousin of my children, on their paternal grandmother's side of the family. It features their 3rd-great-grandparents, their 2nd-great-grandmother, and her siblings. Julia Elizabeth LUKE LUKE (1862 - 1916); yes, she married a cousin! 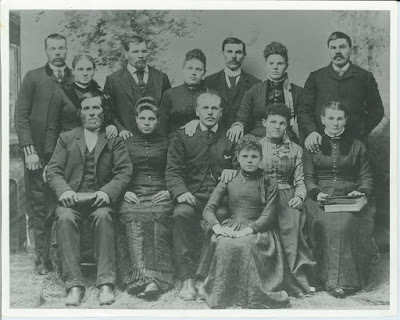 The eleven children who survived childhood are pictured with their parents, who sit on either end of the front row. Seated in the front row from left to right, and numbered in birth order are: Isaac (father), Mandy (10), Simeon (8), Alice (14), Eunice (13), and Rebecca (mother). Standing in the back, left to right are: Alonzo (1), Melissa (4), Robert (2), Julia (7), Orin (6), Angelia (9), and Orville (3). This photograph was probably taken about 1888, likely in Avon, Bon Homme Co., South Dakota, the LUKE family's home at that time. Isaac was a private in the 16th Wisconsin Infantry during the Civil War. He outlived at least three wives (out of four) and six children of his 14 children, dying 18 January 1920 in Avon. Rebecca died 4 July 1911 in Brookings Co., South Dakota. They are buried in Hitt Cemetery, in Avon. Their children lived and died in South Dakota, Washington, Oklahoma, Texas, California, and Wisconsin. 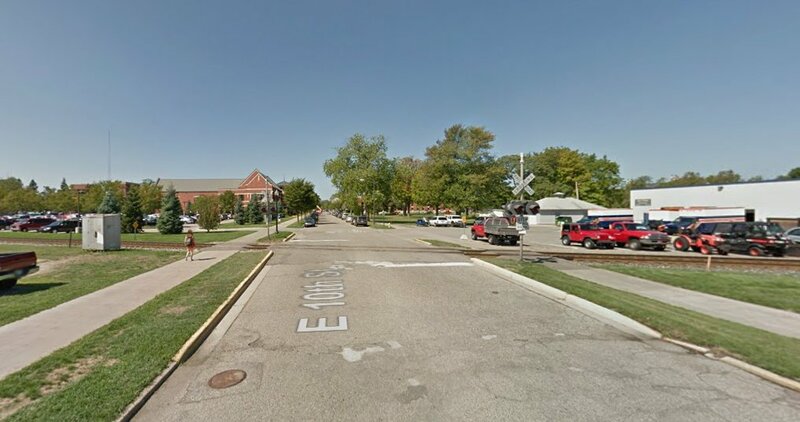 Historical map of Chicago and West Michigan Railroad crossing at Tenth Street, Holland, Michigan. Digital image from page 41 of Standard atlas of Ottawa County, Michigan...., compiled and published by George A. Ogle & Co., 1897. 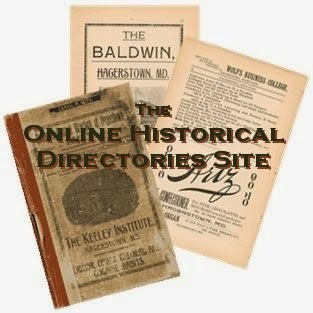 Loutit Library Local History Resources. 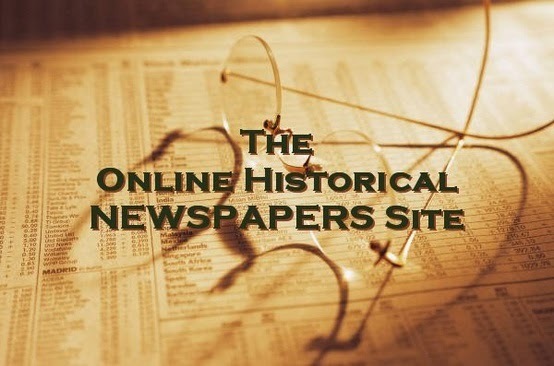 http://www.loutitlibrary.org/local-history-resources : 2015. Modern map of Amtrak Railroad crossing at Tenth Street, Holland, Michigan. Digital image. Google Maps. http://maps.google.com : 2015. Date and cause of death: Accidental death when 13 years old. Hoekstra, John Martin and Lillian Fern (Strong). Family Record Book, Chicago: S. B. Shaw, 1902. Privately held by Miriam Robbins, Spokane, Washington. c. 2000. Like much of the information in this book, the details of Maria's life are a bit off from the facts, mainly because it was written down from memories and oral history, rather from researching records. But I immediately recognized an untold story. What was the accident that killed young Maggie/Maria? Could I find more? How? It's difficult enough to locate records and stories of ancestors that lived long lives; unfolding the details of a short life would be even more challenging. 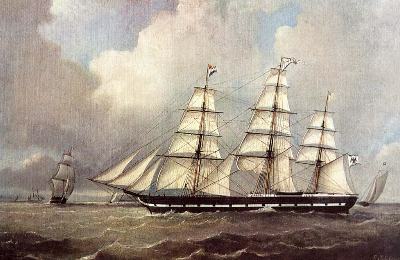 1852 painting of the Arnold Böninger. Palmer List of Merchant Vessels. http://www.geocities.org/mppraetorius/com-ar.htm : 2003. On a late spring day in 1867, a weary middle-aged man boarded the Prussian sailing ship Arnold Böninger in Rotterdam, the Netherlands. Accompanying him was Geertruida, his 15-year-old daughter, the only survivor of three sets of twins that Jan Martens Hoekstra and Pieterke VanTil had borne. Pieterke herself had died only two years earlier; this move to America was Jan's chance for a new life. He and Geertruida had made their way south from their home in Ulrum in the northern province of Groningen. Their destination was Holland, Ottawa County, Michigan, a city of Dutch expatriates seeking religious freedom and a better economy who had settled the area under the leadership of Pastor Albertus C. Van Raalte of the Christian Seceded Church, of which Jan was a member. 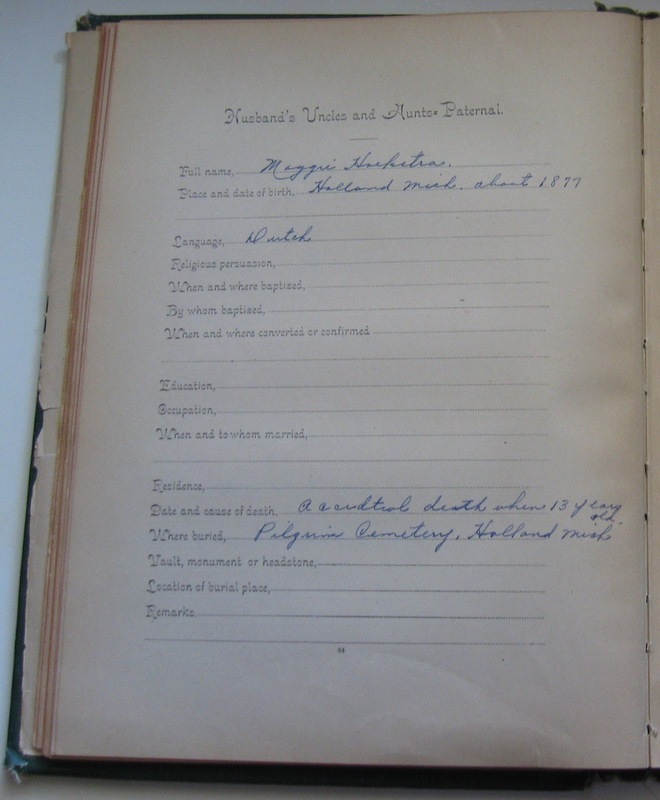 After arriving in New York City on June 11th, the Hoekstras made their way to Holland, where Jan found work as a servant. Only eleven days earlier, the British steamship Iowa had arrived in New York City from Glasgow carrying another widowed Dutch immigrant, 35-year-old Grietje (Jonker) Dekker, her twelve-year-old daughter, Cathrena, and nine-year-old son, Freek. Like Jan, Grietje had known her share of sorrow. Within five years she had buried her husband, a son, and her parents. Her orphaned younger brothers, Willem and Henderikus, ages 25 and 15 respectively, were traveling along and looking forward to a new beginning as well. Grietje also became a servant and her brothers found jobs as carpenters in nearby Spring Lake Township. By late October, Jan and Grietje were married. Neither the short four months between immigration and marriage nor the twelve-year age difference between the couple were surprising; Grietje's home town in the Netherlands was Kloosterburen, situated a mere seven-kilometer (4.3-mile) walk northeast of Ulrum. 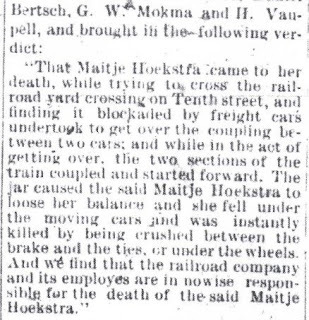 It was very likely the Hoekstra, Jonker, and Dekker families knew each other prior to immigration. Even if they hadn't, Holland was a small town. 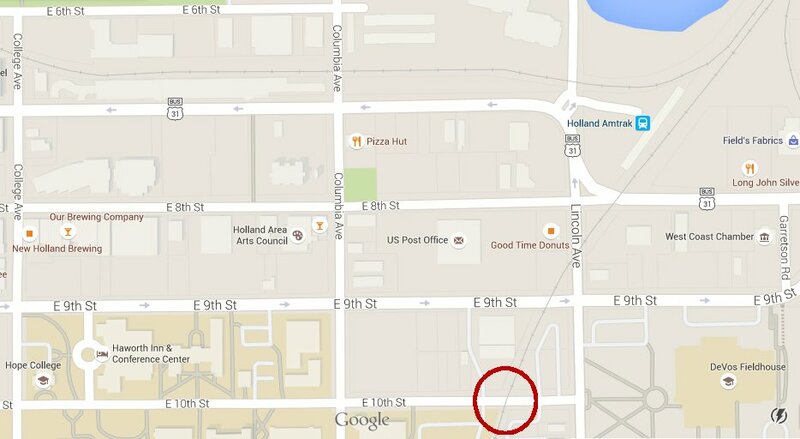 Jan and Grietje may have worked in the same household and likely attended services together, probably at the Ninth Street Holland Christian Reformed Church. Besides, marriage in those days was as much about necessity and survival as about love. Michigan. Ottawa County. Birth Records. 1878. Digital image. 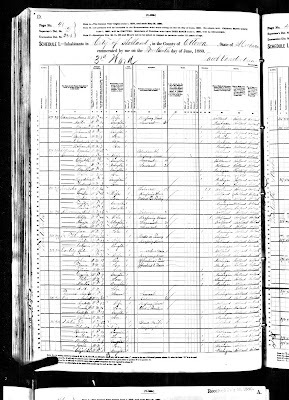 FamilySearch.org, "Michigan Births, 1867-1902." http://www.familysearch.org : 2014. Maria's birth is record 190; the 10th entry on these pages. Jan and Grietje added more children to their blended family. Their first child was my great-great-grandfather, Martin, born in 1868. Then came the first Maria, born in 1870, who died shortly before her third birthday from liver cancer. Fonytje ("Finnie") was born in 1874, and the second Maria, the subject of this story, was born 4 April 1878. 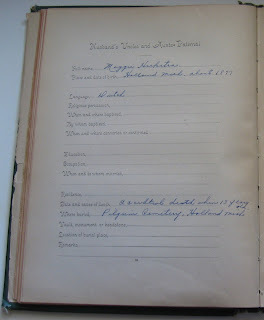 In addition, the Family Record book states that two sets of twins were born to Jan and Grietje and died in infancy. In those days, families generally had children every two years, a natural cycle of pregnancy, nursing (which usually suppresses conception), and weaning; it's possible those sets of twins were born in the years 1872 and 1876. 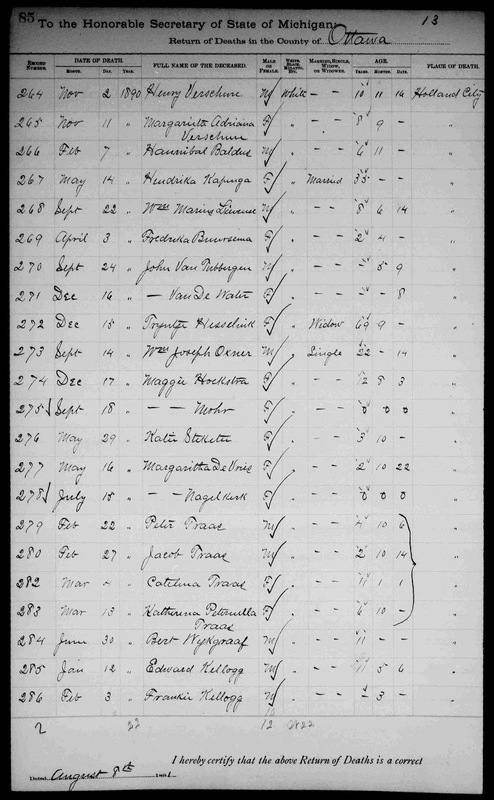 A burial of 10 September 1874 for "a child of Jan Hoekstra" has been found in the Pilgrim Home Cemetery records; whether that is one of the twins born c. 1872 or a possible twin of Finnie is up for speculation. Perhaps it is a different family altogether. 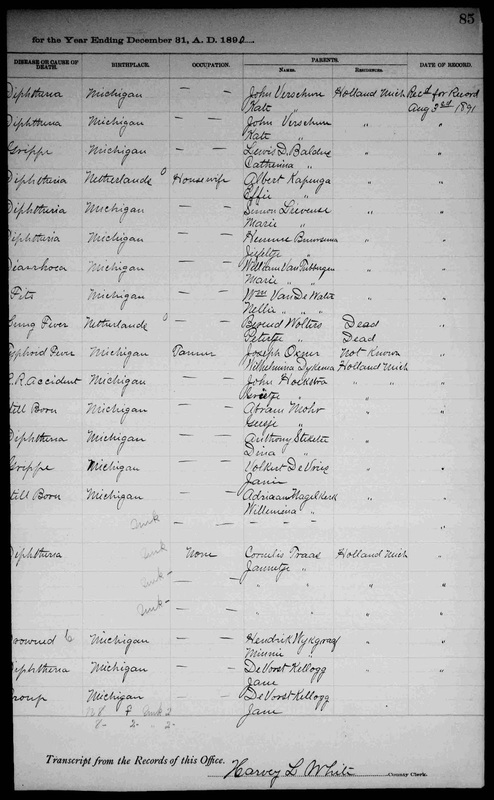 Although Michigan kept birth and death records beginning in 1867, until 1897 (deaths) and 1902 (births) they were done annually census-style, and thus many individuals were missed. Regardless, we know from the 1880 Federal Census that only three children survived the very dangerous years of infant and early childhood mortality: Martin, Finnie, and (the second) Maria. Michigan. Ottawa County. 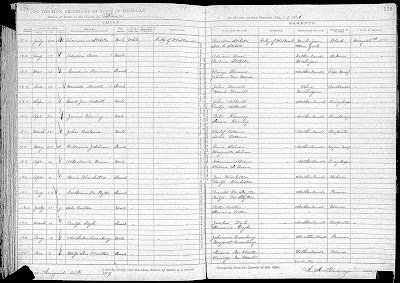 1880 U.S. census, population schedule. Digital image. Ancestry.com. http://www.ancestry.com : 2007. The Hoekstra family is enumerated on lines 16-20. Typical of many of my Frisian-Dutch immigrant family members, Maria was known by several names. 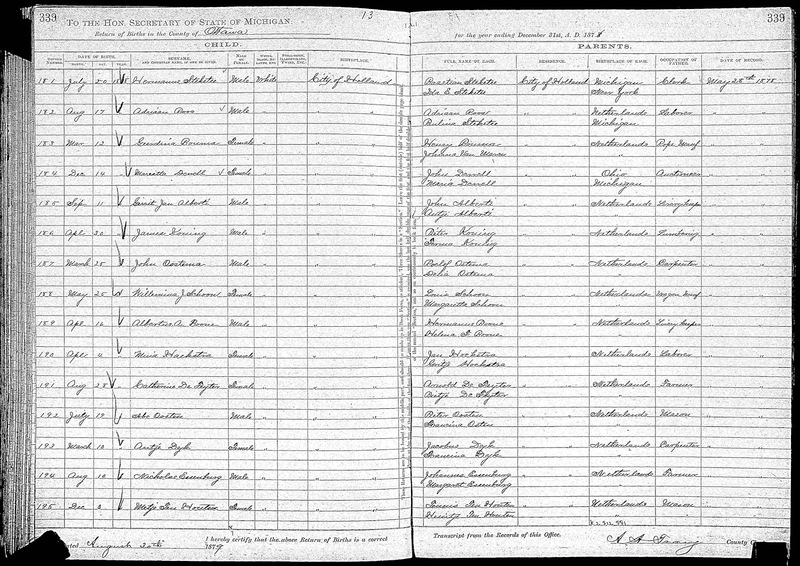 She is recorded as Maria (misspelled "Maia") in the county birth record. But we know from a later newspaper account that she generally went by "Maitje," which to the ears of English speakers probably sounded a lot like "Maggie." While the official recorders of that time were probably familiar with Dutch names, they may not have been as familiar with Frisian spellings and name variations. These English, Dutch, and Frisian variations and spellings create challenges when attempting to locate individuals in official records. 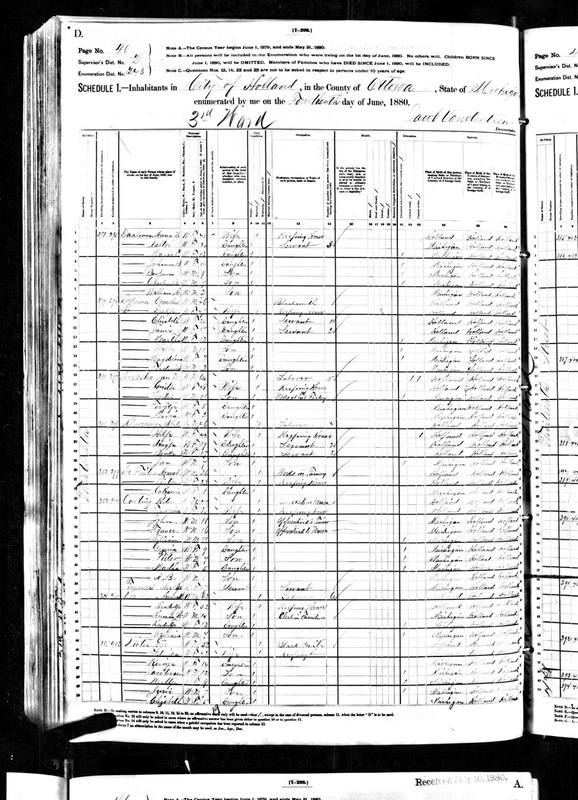 For instance, I have yet to find this family enumerated on the 1884 Michigan State Census, even after scrolling image by image through the online pages at Seeking Michigan. With these difficulties, could I find the complete story of Maria? 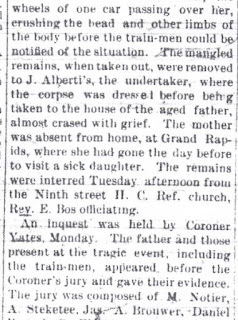 I was able to locate her record in the Return of Deaths for Ottawa County that gave me an important detail: the cause of death was a railroad accident. Michigan. Ottawa County. Death Records. 1890. FamilySearch.org, "Michigan Deaths, 1867-1897." http://www.familysearch.org : 2015. Maggie's entry is record 275; the 11th entry on each page. 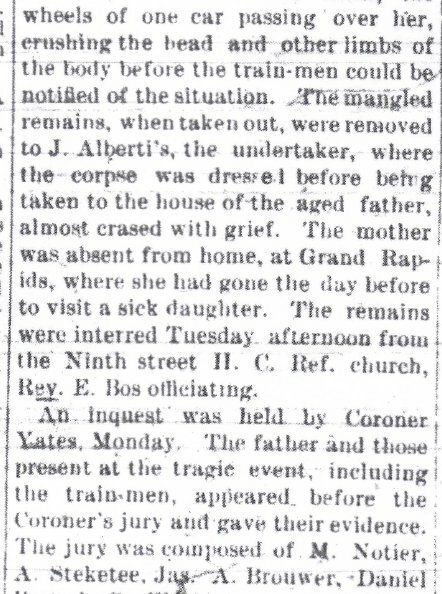 The date of death is incorrect; according to a newspaper article published on 13 December 1890, she died on the 7th (not the 17th) of December. 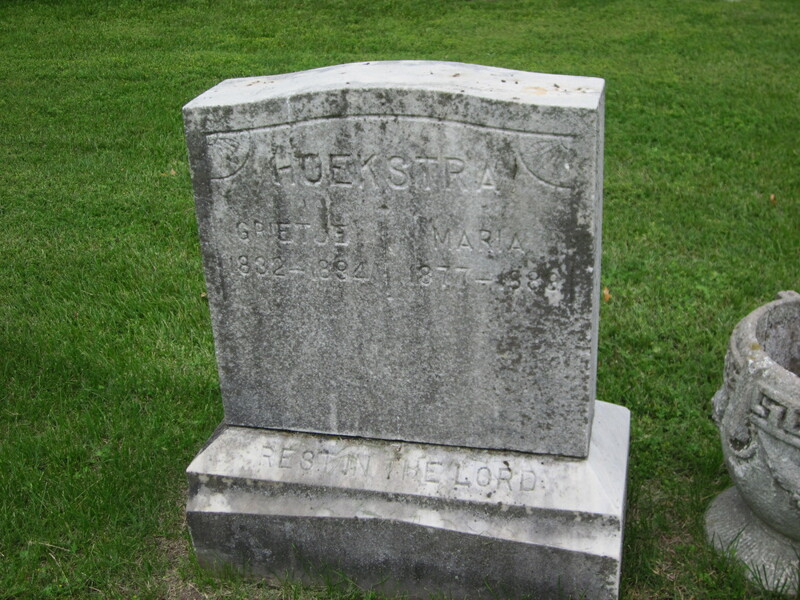 Grave of Maria Hoekstra, Block M, Lot 35, Pilgrim Home Cemetery, Holland, Ottawa County, Michigan. Digital photograph by Find A Grave volunteer "Scout" and privately held by Miriam Robbins, Spokane, Washington. 2013. “State News Condensed,” Saline (Michigan) Observer, 18 December 1890, p. 8, col. 2; digital image, CMU Online Digital Object Repository (http://condor.cmich.edu/cdm/landingpage/collection/salineobs : 2015), MDNP-Washtenaw-Saline Observer. 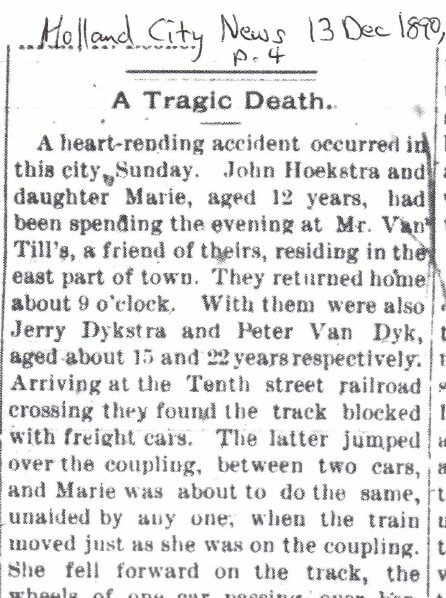 “A Tragic Death,” Holland (Michigan) City News, 13 December 1890, p. 4. Amtrak Railroad crossing at Tenth Street, Holland, Michigan. Digital image. Google Maps Street View. http://maps.google.com : 2015. View looking west on Tenth Street. What remains to finish my research and honor the life of young Maria? I hope to access the original inquest report and perhaps discover church records for this one whose life was cut much too short. 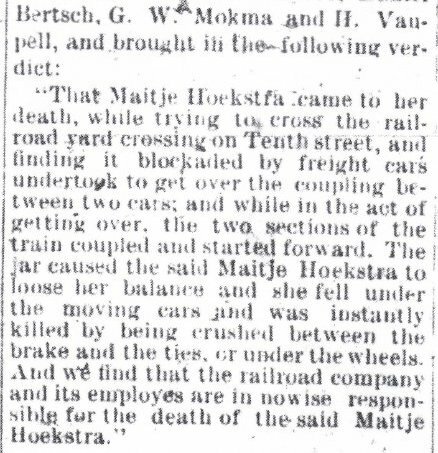 Someday, I'd like to visit Holland again, find the home (or site) where the Hoekstra family lived, visit this railroad crossing, and lay a flower at Maria's grave. I could not have fleshed out the skeleton of Maria's story without help from a number of people. First of all, thanks to Find A Grave photo volunteers "genealogymaster1" and "Scout" for taking photos of Maria's grave. Secondly, to Find A Grave contributer Pat Harney, who discovered the Saline Observer article, and took the time to contact me. 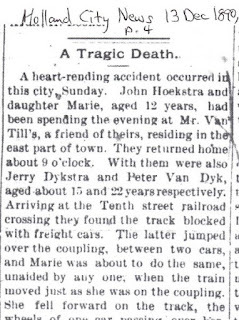 Huge thanks is due to genealogy Facebook friend, Mary Raper, who went to the Herrick District Library and found the detailed article in the Holland City News and verified the publication date, which clarified Maria's death and burial dates (there were conflicting dates in various records). Finally, I thank my cousin Michelle "Missy" (Hovenkamp) Alkema, who is a descendant of Finnie Hoekstra VanTil, sister of my Martin and of Maria. Missy researched and provided evidence of Grietje's immigration on the ship Iowa through a very incorrect passsenger list and a number of vital and immigration records in online Dutch collections. It is so fun to have a co-researcher on our mutual Hoekstra line!